MogoBlog MogoLicious Tasty Tip of the Day: Frappuccinos are actually pretty easy to make at home, so we try to keep strong coffee ice cubes in the freezer during the summer…..for our favorite drink anytime at home. Not only can you easily change up the flavor, but it’s super easy to make them with fewer calories than the coffee shops serve as well! Once coffee ice cubes are frozen, add to blender with creamer and milk. Blend until smooth. If frappuccino is too thick, you may need more creamer (or milk). Just add a little at a time until consistency is pourable. Pour into glasses, and top with whipped cream, caramel topping. Serve with a straw. 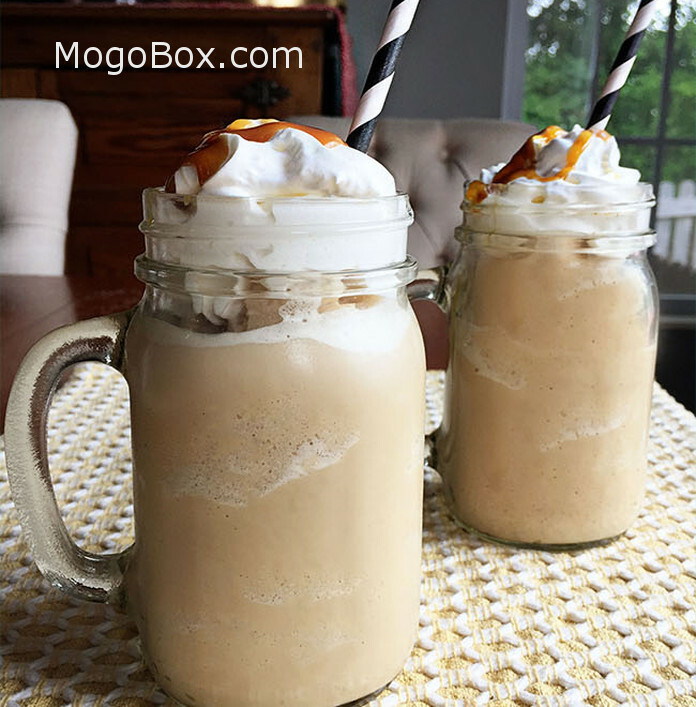 This entry was posted in MogoBlog, MogoLicious and tagged #MogoBlog, Caramel Flavored Coffee, Caramel Flavored Creamer, Caramel Topping, Milk, MogoBox, MogoLicious, Whipped Creamer.